Previews: Saturday, March 18 at 11 a.m. and 1 p.m.; and Sunday, March 19 at 11 a.m. Regular Run: Saturdays and Sundays at 11 a.m. and 1 p.m.
ChiIL Mama is giving away a family 4 pack of tickets ($60 Value) for any of the performances on Saturday March 25 and 26. The shows on Saturday, March 25 are at 11:00am and 1:00pm and the shows on Sunday are 11:00am and 1:00pm as well. Enter through midnight on Tuesday, March 21st. Running a farm is hard work, especially with cows that type, hens on strike, and a duck who’s always causing trouble. So Farmer Brown takes off for a well-deserved vacation, leaving his brother Bob, an accountant from the city, in charge. Soon it’s no work and all play (and cake, pizza, movies, and bubble baths...) as the animals run wild, taking advantage of Bob’s lack of experience. Will the animals come clean about their devious tricks, or is there more to Brother Bob than meets the eye? Take a break from the grind with the gang from Farmer Brown’s farm with our hit musical adaptation of the 2002 New York Times bestselling book by Doreen Cronin and Betsy Lewin. Tickets are $15 and may be purchased at the Lifeline Theatre Box Office, 773.761.4477, or by visiting www.lifelinetheatre.com. The book will be on sale in the lobby. The Saturday, April 1, 11 a.m. performance will feature a pre-show touch tour of the set at 10 a.m. and live audio description for patrons who are blind or have low vision. The Saturday, April 8, 1 p.m. performance will feature open captioning for patrons who are deaf or hard-of-hearing. And there will be a autism/sensory-friendly performance on Saturday, April 15 at 3 p.m. for patrons with social and/or cognitive disabilities. For more information about Lifeline’s accessibility services, please contact Accessibility Coordinator Erica Foster at 773.761.4477 x703 or at access@lifelinetheatre.com. Running a farm is hard work, especially with cows that type, hens on strike, and a duck who’s always causing trouble. So Farmer Brown takes off for a well-deserved vacation, leaving his brother Bob, an accountant from the city, in charge. Soon it’s no work and all play (and cake, pizza, movies, and bubble baths) as the animals run wild, taking advantage of Bob’s lack of experience. Will the animals come clean about their devious tricks, or is there more to Brother Bob than meets the eye? Take a break from the grind with the gang from Farmer Brown’s farm with our hit musical adaptation of the 2002 New York Times bestselling book. Lifeline Theatre ensemble member Heather Currie (Pig); with guest artists Bernell Lassai (Farmer Brown/Brother Bob), Jennifer Ledesma (Cow), Carolyn Plurad (Hen), and Brian Tochterman Jr. (Duck). With understudies David Gordon-Johnson and Maisie Rose. Lifeline Theatre ensemble members Alan Donahue (Scenic Designer); James E. Grote (Adaptor), and Shole Milos (Director); with guest artists Jana Anderson (Costume Designer), Erik S. Barry (Lighting Designer), Blake Burke (Properties Designer), George Howe (Composer, Lyricist & Music Director), Anthony Ingram (Sound Designer), Lavina Jadhwani (Casting Director), Jacqueline Marschke (Stage Manager), Jennifer McClendon (Production Manager), Sam Moryoussef (Master Electrician/AV Supervisor), and Joe Schermoly (Technical Director). Lifeline Theatre also offers “Name Your Price” tickets one half-hour before the show (subject to availability) and group rates for 15 or more tickets. A party room is available for full-service birthday parties and special events. Free parking is available at the Field School parking lot (7019 N Ashland Ave., entrance on Greenleaf Ave. between Ashland and Greenview) with free shuttle service before and after the show. Street parking is also available and Lifeline Theatre is conveniently located near the CTA Red Line (Morse stop) and #96 Lunt and #155 Devon bus routes. Lifeline Theatre is accessible to people with disabilities. Lifeline Theatre’s programs are partially supported by Alphawood Foundation; A.R.T League Inc.; Elizabeth F. Cheney Foundation; The Chicago Community Trust: Persons with Disability Fund; The Common Cup; Gaylord and Dorothy Donnelley Foundation; FGMK LLC; Flex Print, Inc.; Lloyd A. Fry Foundation; The Grover Hermann Foundation; Illinois Arts Council Agency; Lagunitas Brewing Co. Community Grant Program; MacArthur Fund for Arts and Culture at Prince; The Polk Bros. Foundation; Poubelle Fund, a Donor Advised Fund of Renaissance Charitable Foundation; Rogers Park Social; S&C Electric Company Fund; The Shubert Foundation; and the annual support of businesses and individuals. 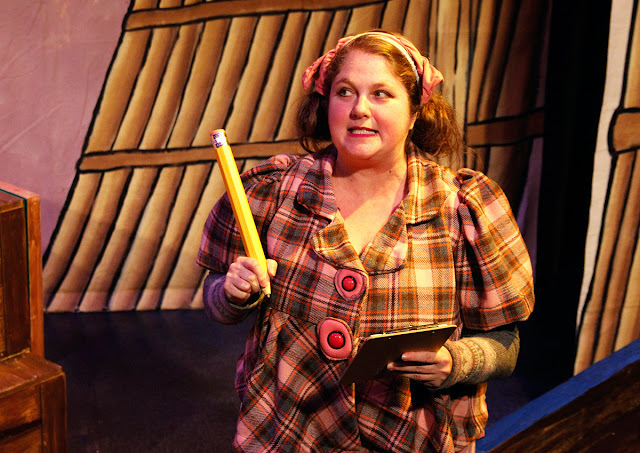 Lifeline Theatre’s KidSeries presents Giggle, Giggle, Quack; a family musical based on the book by Doreen Cronin and illustrated by Betsy Lewin (Originally published by Atheneum, 2002. Used with permission of Pippin Properties, Inc.). The production is adapted by Lifeline Theatre ensemble member James E. Grote, with music and lyrics by George Howe, and directed by Lifeline Theatre ensemble member Shole Milos; the same team that created Lifeline’s popular adaptations of the beloved Cronin & Lewin books, Click, Clack, Moo: Cows That Type; Duck for President; Dooby Dooby Moo; and Click, Clack BOO! A Tricky Treat.